How can I help you read the Bible more? I was talking to a group of young (compared to me) adults the other night. Here’s the first part of what I told them, in answer to the question above. I’m going to assume that you are typical. I know, you are special and wonderful and amazing. But so is everyone. And so that makes you typical. And I’m going to assume that you are churchgoers. That’s not a negative thing. It just means that you fairly regularly go to church. There’s a big body of research that says that 45% of churchgoers read the Bible at least a few times a week, 18% every day. So if you are typical, more than half of you read the Bible once a week or less. Which is fine, I suppose. Except that Bible reading is the single biggest factor connected to growing spiritually. I’m not sure that the best way to get more people reading the Bible is to tell people to read the Bible. We hear that all the time. So instead, I want to make four practical suggestions to help 55% of you get a bit more connected to reading the Bible. It could be a library chair or a chair in a coffee shop or a chair in your living room. But it’s got to be a comfortable chair where you can sit with a cup of coffee and spend fifteen minutes reading the Bible and talking with God. Not too comfortable, I suppose. But pick one. Why? Because human beings are habitual. And if we know that’s the chair where we sit to talk with God, it means that we don’t have to make that choice every day. This is mine. It’s from my office at home. I have two chairs, but this is my morning coffee with God. 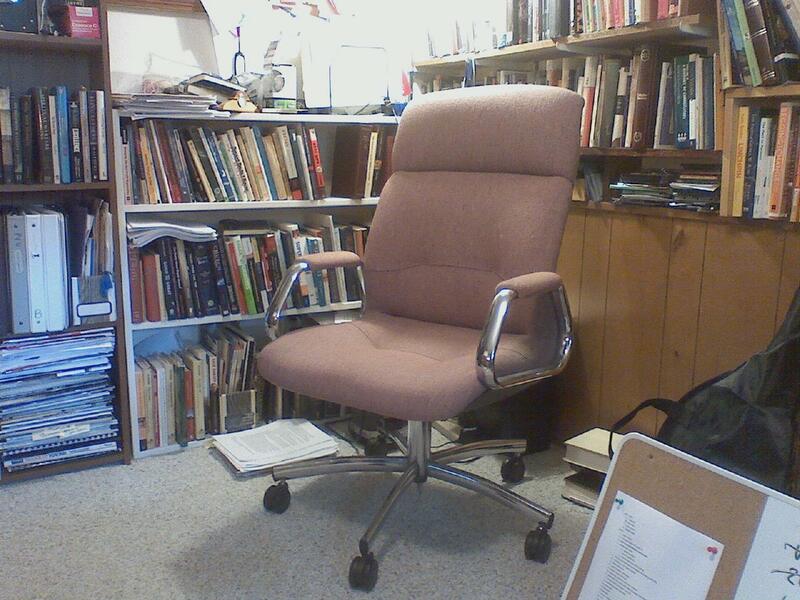 My life changed when I picked this chair. I sit there with my Moleskine notebook and my Field Notes pen and I write the date in the top right corner of the page and I start writing to God and then I read something. And I do this early in the morning. My Comment! is forming before I even let the promised “more tomorrow” arrive. . . That is not appropriate . . . I will wait until you finish . . .
and now that it’s tomorrow, you commented and I’ll answer. Stopped by today. Great post!